The Best Tiny House blogs from thousands of top Tiny House blogs in our index using search and social metrics. Data will be refreshed once a week. Also check out Tiny House Youtube Channels. 2.3 Tiny Living - Tiny Houses, Less Stuff, More Freedom. Tiny House newsletter is a comprehensive summary of the day's most important blog posts and news articles from the best Tiny House websites on the web, and delivered to your email inbox each morning. To subscribe, simply provide us with your email address. About Blog Taking you on an exploration through the tiny house movement with tours of tiny homes, small houses, cottages, cabins, RVs, and more. Facebook fans 232,141. Twitter followers 10,868. About Blog Tiny House Town a home blog sharing beautiful tiny homes and houses, usually under 500 square feet.Tiny House Town is a blog sharing the homes and houses of people and companies all over the world who have gone tiny. We post multiple new tiny houses a week to show and share how anyone can live a simpler life in a small space. The majority of our homes are under 500 sq ft.
Facebook fans 21,880. Twitter followers 249. 3. Tiny Living - Tiny Houses, Less Stuff, More Freedom. About Blog Tiny Living provides the resources and inspiration you need to build or buy your tiny house, simplify your life, and enjoy your newfound freedom. Facebook fans 9,048. Twitter followers 33. About Blog Tumbleweed Tiny Houses are unlike any Tiny Houses you've ever seen before. 100's of options to customize your Tiny House on Wheels. Facebook fans 295,405. Twitter followers 11,177. About Blog Tiny House Community was created in 2010 to help enthusiasts find resources needed to help them learn, build, park, and live the tiny house dream. Facebook fans 33,391. Twitter followers 10. About Blog Tiny Home Builders can help you simplify your life and live tiny. We have books, plans, workshops trailers and houses to help you build your dream.Your source for everything for your DIY Tiny House.Here you’ll find the latest news and information from Tiny Home Builders. Learn and be inspired as you follow along with us as we discuss the most asked about topics on tiny houses. Facebook fans 24,417. Twitter followers 5,253. USA About Blog The leading tiny house marketplace. Search thousands of tiny houses for sale and rent and connect with tiny house professionals. Facebook fans 374,231. Twitter followers 10,454. Fair Oaks, CA About Blog Welcome to Tiny House Design. To follow my growing personal interest in tiny houses and living light I decided to start a blog to capture the things I find.This blog is simply going to focus on making the mental transition to living lighter and smaller. I’ll also post ideas I have for tiny house design. Facebook fans 354,159. Twitter followers 24,403. About Blog With over 20 tiny house plans on offer, you're sure to find something to meet your needs and set you on your way towards building your own tiny house. Facebook fans 31,400. Twitter followers 2,973. About Blog We are a couple that is starting a blog about tiny home and tiny living with a minimalistic mindset. We discuss product reviews for homes and tiny communities along with views/ideas for the transition into the tiny house movement. We are a great resource for people looking to join the tiny home movement or have general questions about the tiny home communities and ideas. About Blog We designed, built and now live full time in our 204 sf tiny house on wheels.This is where our Tiny house baby sleeps. Facebook fans 8,064. Twitter followers n/a. About Blog A place for people interested in small or tiny houses. Facebook fans 2,795. Twitter followers 532,152. New Zealand About Blog Join me as I live large on my downsized journey, travelling and discovering unique tiny houses across the globe.Follow us on our journey to downsize our lives, design, build and live in our eco friendly, off-grid tiny house! Facebook fans 59,047. Twitter followers 5,033. Facebook fans 14,625. Twitter followers 183. About Blog This blog is dedicated to small space living and great design. Features studio apartments, tiny houses, cabins, campers and other small dwellings. Facebook fans 11,835. Twitter followers 845. About Blog Andrew Morrison has been a professional builder for 20 years and has been teaching people how to build their own homes in his hands on workshops since 2004.He has personally taught over 2,500 participants how to hand craft their own homes.Learn how to build your own tiny house from expert builder Andrew Morrison and save tons of money and time in the process! We show you how, step by step! Facebook fans 46,383. Twitter followers 231. About Blog Tiny House Giant Journey is a popular Tiny House and Travel blog with inspirational stories, advice, videos and photography from around the world. Facebook fans 32,976. Twitter followers 4,968. About Blog I blog about frugal and simple living on a budget at Cozy Little House. About Blog Starting in June of 2012, I built my own tiny house on wheels. I really love it. Since then, I've written and published a book to help you build your own tiny house, called Tiny House Decisions. Facebook fans 51,244. Twitter followers 1,245. About Blog I design and build quality and affordable Tiny Houses relevant to the Rocky Mountains of Colorado, Utah, Idaho, Montana, Wyoming, and New Mexico. Facebook fans 12,765. Twitter followers n/a. California, USA About Blog We are Shelley and Joshua. Thanks for checking out our tiny house adventure!Follow along on our website as we show you the Ins and Outs of Tiny Living,Custom Tiny House Trailers, Tiny House Shells and Tiny House Plans from your ultimate resource for all things tiny house related. Facebook fans 35,795. Twitter followers 315. About Blog A simple life. This is a story about building my own tiny house, my family and all the trials and triumphs along the way! Facebook fans 11,754. Twitter followers 120. About Blog Your resource for building tiny house on wheels (THOW). DIY tiny house is built on a trailer; a simple, mobile, efficient form of housing. Explore tiny house plans, guides, best appliances, books and other resources. Facebook fans 11,982. Twitter followers n/a. About Blog PAD connects do-it-yourselfers with the resources and information they need to build homes that fit the lives they want to live. Our tiny house construction plans, ebooks and educational workshops have helped thousands of people learn to build a little house on wheels that offers them new ways to see their time, money, hobbies, possessions and communities. Facebook fans 22,381. Twitter followers n/a. About Blog Hi, I’m Melanie! Welcome to my blog, A Small Life. For almost four years, I lived in a 1978 Airstream Sovereign with my husband, George. We’re now renovating our small home! We chose the small life to get out of the paycheck-to-paycheck cycle and live the life of our dreams. I want you to help you do the same! About Blog At age 12, Sharon Read was drawing floor plans for homes that she proudly labeled as “bare minimum design".As America struggled to recover from the glut of unsold mini-mansions, Sharon realized tiny homes were the future. She recognized that people want to live simply without stressing the environment. Follow this blog to know more about Seattle Tiny Homes. Facebook fans 15,108. Twitter followers 3,186. About Blog As a Tiny House pioneer Marjolein is an ambassador for the Tiny House movement in the Netherlands. It is her mission to get the people in the Netherlands acquainted with the philosophy behind the movement and to make living Tiny legally possible throughout the Netherlands. Facebook fans 8,630. Twitter followers n/a. Colorado Springs, CO About Blog We provide tiny home insurance for customers of all life styles. DIY, builder-built, self-built on a trailer, on a foundation, on skids, on wheels. We offer protection against theft and we can do trip endorsement for one move or 100. Facebook fans 175. Twitter followers 322. Facebook fans 15,896. Twitter followers n/a. West Lothian, Scotland About Blog Tiny House Scotland is a UK tiny house designer and builder of the NestHouse and NestPod - small scale innovative moveable architecture by Jonathan Avery.Follow this blog to know more about Tiny house DIY, tiny house trailers and much more. Facebook fans 2,772. Twitter followers 679. Canada About Blog Tiny Home Alliance Canada is the #1 place to learn about the small home movement in Canada. Visit our forum, library and resources to learn more. Facebook fans 2,200. Twitter followers 157. About Blog You don't have to live large to live beautifully." Goods ideas for stylish, simple living from The Tiny Canal Cottage by Whitney Leigh Morris.Whitney Leigh Morris is a Creative Director based in Venice.This blog is based on her live/work family lifestyle in The Tiny Canal Cottage. About Blog My name is Shavonda and welcome to SG Style…Where small spaces and boho vibes are a really big deal! Join me as I share our families downsizing journey, big ideas for small space living, my love of moody eclectic interior design, and the occasional outfit or two. Facebook fans 241. Twitter followers 490. Asheville, NC About Blog Laura M. LaVoie is a freelance writer and blogger living in a 120 Square Foot Cabin with her partner, Matt, and their Sphynx cat, Piglet. Laura and Matt built the tiny house with their own hands after researching several types of alternative building techniques including Cordwood Masonry and Earthships.Follow this blog for more about their Life in 120 Square Feet. Facebook fans 6,876. Twitter followers 327. About Blog This is the story of a beautiful tiny house on wheels, built in New Zealand and home to two Kiwi guys and two Dachshunds. Follow our life in the house, our learning curve, our dream of a more minimalist but meaningful life, and the challenges and solutions of “going tiny”. Facebook fans 41. Twitter followers 205. About Blog Downsized, Organized, having more with less- Sharing and Loving my Tiny Home Life! I did it, anyone can. Living Intentionally and Blessed. About Blog Family life in an RV turned tiny home. Trials and adventures of living tiny in the Pacific Northwest. Facebook fans 1,540. Twitter followers n/a. About Blog Kerri Fivecoat-Campbell is a writer and author living her dream life in her little house with her husband, Dale and currently five rescue dogs. She’s been blogging at Living Large in our Little House since 2009 when she discovered the Tiny/Small House Movement. Facebook fans 65,778. Twitter followers 1,009. About Blog The story of life in my off grid tiny home, Fy Nyth (welsh for my nest), which is nestled in the northern mountains of WY. Minnesota About Blog Tiny Green Cabins is a custom builder of transportable, sustainable, healthy, tiny houses and micro homes. We sell plans and design services for those desiring. Follow this blog to know more about Tiny green cabins. Facebook fans 13,766. Twitter followers 5,186. Gresham, OR About Blog Tiny Innovations builds custom tiny houses, tiny house shells, shipping container conversions, food cart trucks, tiny home hotels and RV parks, and more. Facebook fans 635. Twitter followers 157. About Blog Mobile Tiny House design and build in Napier New Zealand. A series of how to blogs and videos to build your own tiny house. About Blog Modern Tiny Living is a company founded on the love for the freedom, sustainability, and flexibility provided by a tiny home lifestyle! About Blog Alternative housing and sustainable energy.Leanne Stephens is a passionate advocate for tiny living and decluttering your life.On this website, Leanne shares the stories of people who are living the tiny life or are in the process of building, to give them a voice and to show others that yes, it is possible, and people just like you are making it happen. Facebook fans 817. Twitter followers 539. About Blog B.A. Norrgard’s personal story of change and beginner’s guide to tiny housing, career transitioning, lifestyle changes, and conscious downsizing. Facebook fans 6,204. Twitter followers 713. About Blog A blog about Tiny House Living in NZ, sharing tips, DIYs and wicked discounts and promos on Tiny House Products and Services such as tiny house broadband, Tiny House Trailers, Financing for a Tiny House, and Solar Packages. Facebook fans 12,638. Twitter followers 26. About Blog desTINYdweller is about decluttering your life and finding happiness in the simple things. It is run by tiny house owner and entrepreneur Ashlee Fazio. Facebook fans 1,035. Twitter followers n/a. Boston's Northshore About Blog The Silver Bullet, is a model for living a sustainable tiny lifestyle. I designed and built this zero-waste, off-grid, non-toxic tiny house which serves as a modular classroom for sustainable lifestyle design. About Blog My name is Fawn, and I am a woman gutting and reconfiguring a 1976 Terry travel trailer (mostly) by myself. This blog is about my life journey while living in a small house. About Blog At Tiny Living Spaces we are dedicated to the safety, craftsmanship and longevity of your tiny home. About Blog Hi! My name is Sarah. Thanks for visiting my blog! My husband, Jordan, and I live in a 160 sq ft tiny house, dubbed Lil Blue, that's parked on a grass-fed meat farm in central Iowa. A Terracotta Life began as a creative outlet for me and as a way to document my newfound simple-tiny-house-farming lifestyle. The title came from the desire to demonstrate that every person can live a beautiful life. About Blog A TINY HOUSE? NO PROBLEM. OR IS IT? Join our family as we attempt to go tiny. I am going to let you follow the journey. And if you know anything about me...I tell it like it is. Here we go! Facebook fans 652. Twitter followers 90. 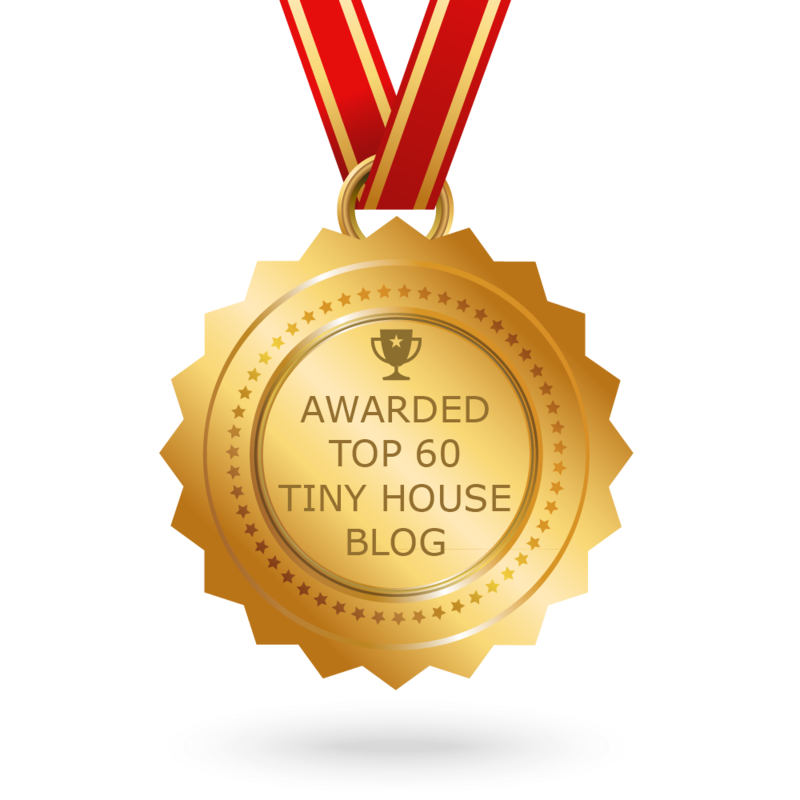 CONGRATULATIONS to every blogger that has made this Top Tiny House Blogs list! This is the most comprehensive list of best Tiny House blogs on the internet and I’m honoured to have you as part of this! I personally give you a high-five and want to thank you for your contribution to this world.